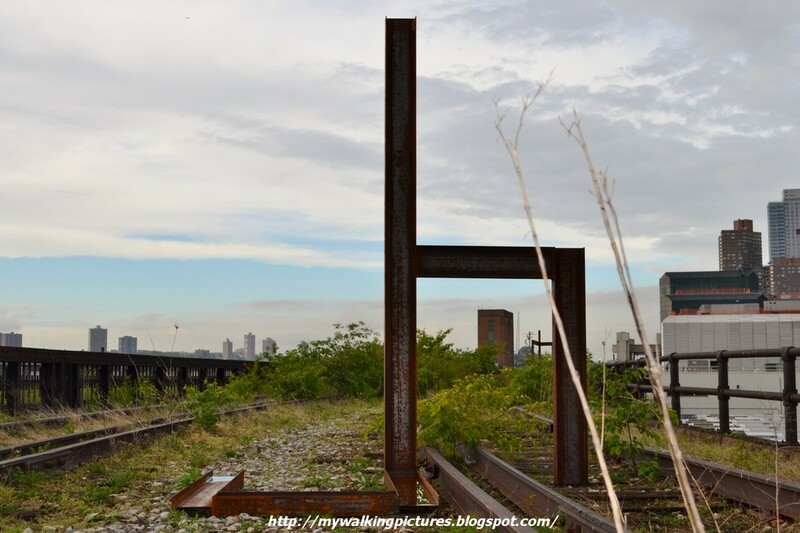 Last month I was invited by Friends of the High Line for a photo walk to see a new High Line Art installation by New York artist Carol Bove on the High Line at the Rail Yards. High Line Art presents Caterpillar by artist Carol Bove, a HIGH LINE COMMISSION featuring seven sculptures that punctuate the wild landscape on the High Line at the Rail Yards, the third and final section of the High Line. On view for one year beginning Thursday, May 16, 2013, Bove’s commission is the last opportunity to see this section of the elevated railway in its natural state before it opens as public parkland in 2014. The commission will be viewable during public walks on Thursdays, Fridays, and Saturdays until May 2014. This was the first of the seven sculptures I came across at the rail yards that day. The Hudson Rail Yards or the West Side Yard (officially the John D. Caemmerer West Side Yard) is owned by the Metropolitan Transportation Authority and is used to store commuter rail trains operated by the Long Island Rail Road. The yard sits between West 30th Street, West 34th Street, Tenth Avenue and Twelfth Avenue, at the north end of the High Line. Eventually, the Yards will one day become the interim walkway for the Hudson Yards development. 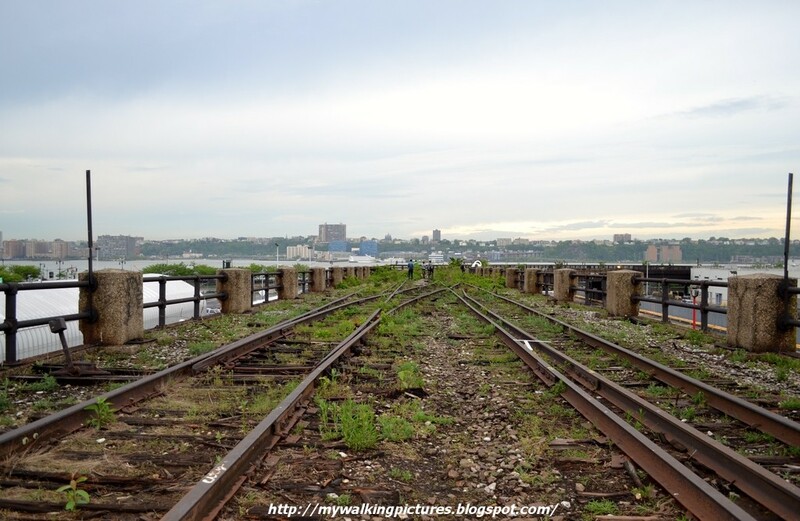 I was with other volunteer photographers and we convened at the 34th Street end of the rail yards. 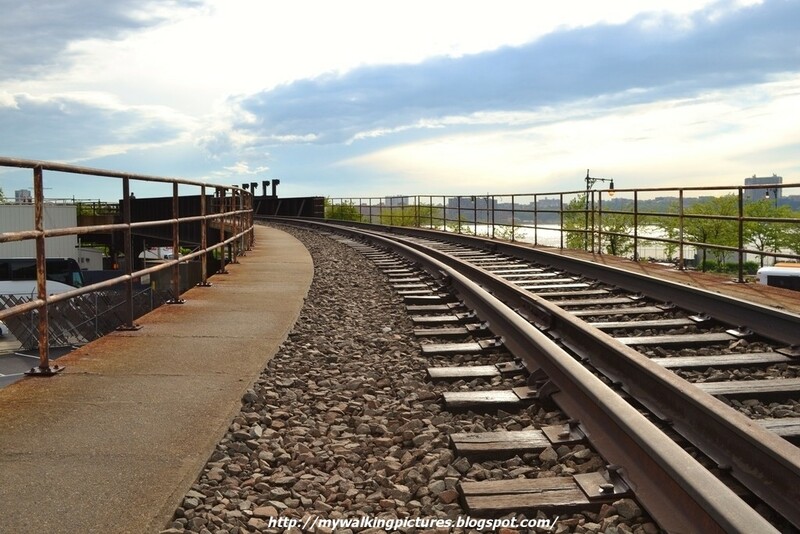 The train tracks curve gracefully where we started our walk. 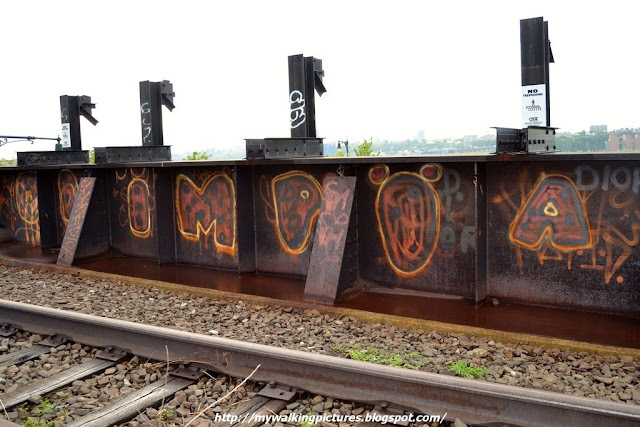 Even though the area is fenced off, there are graffiti on some parts of the tracks, I like seeing these expressions of art, as long as they don't desecrate or damage the place. 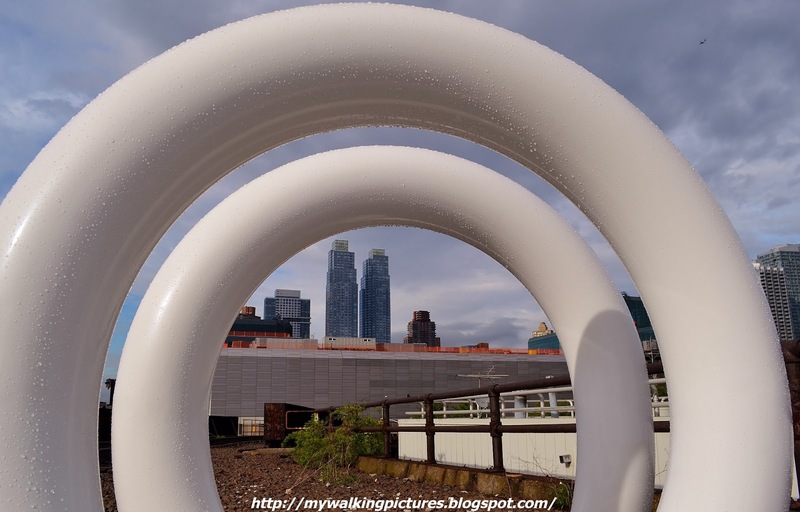 The sculpture in the first pic above looks like a giant paper clip bent a little bit, but if you play with the angles you get a different image each time. 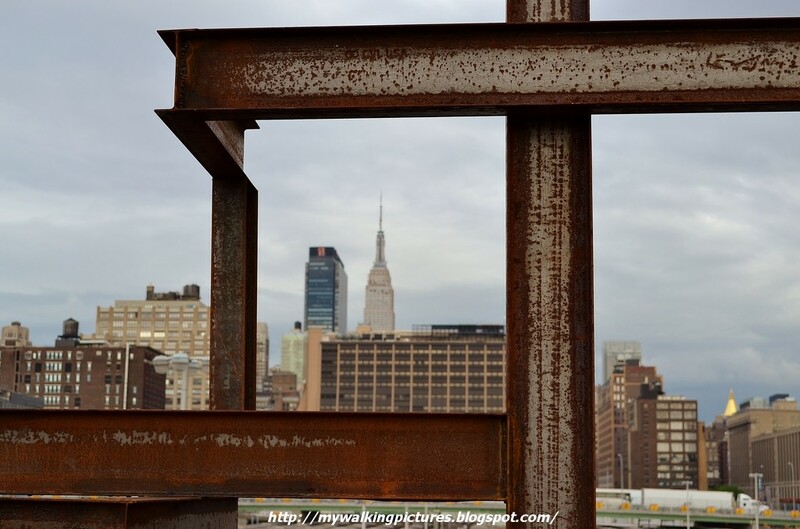 I like seeing Manhattan's buildings framed inside the art pieces. It rained that afternoon but has already tapered off when we started our photo walk, but you can still see the droplets clinging to some of the sculptures. 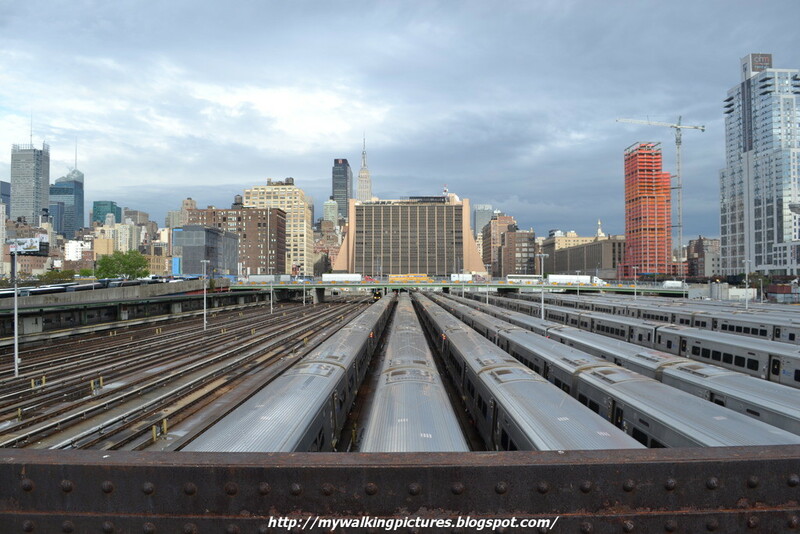 Looking east, you can see the trains of the Long Island Rail Road parked in the rail yards, as well as the Empire State Building at the distance, towering over midtown Manhattan. 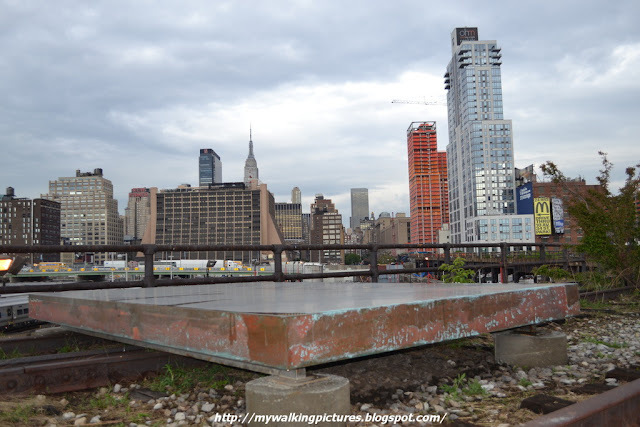 Near this area is where Carol Bove's second sculpture is displayed. By using platforms and plinths, the artist creates unique environments that combine the tradition of modernist abstract sculpture with the seductive atmospheres of shop windows and commercial displays. 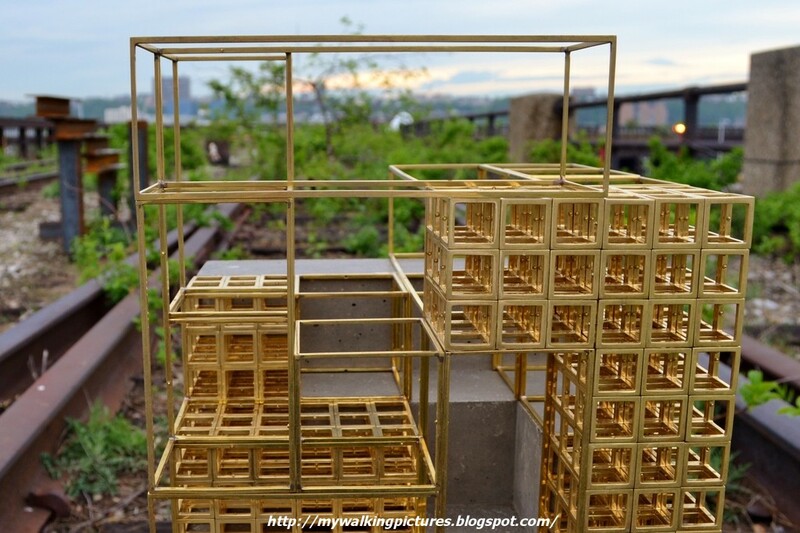 I tried to frame the Empire State Building within the sculpture and this was what I came up with. 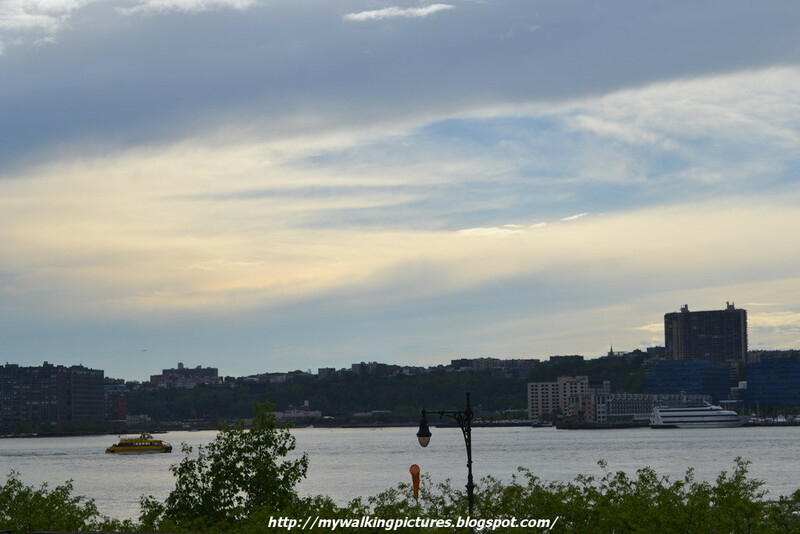 Looking west, you can see the Hudson River and New Jersey across. Too bad it was cloudy that day, the sunset from here would have been a gorgeous sight. 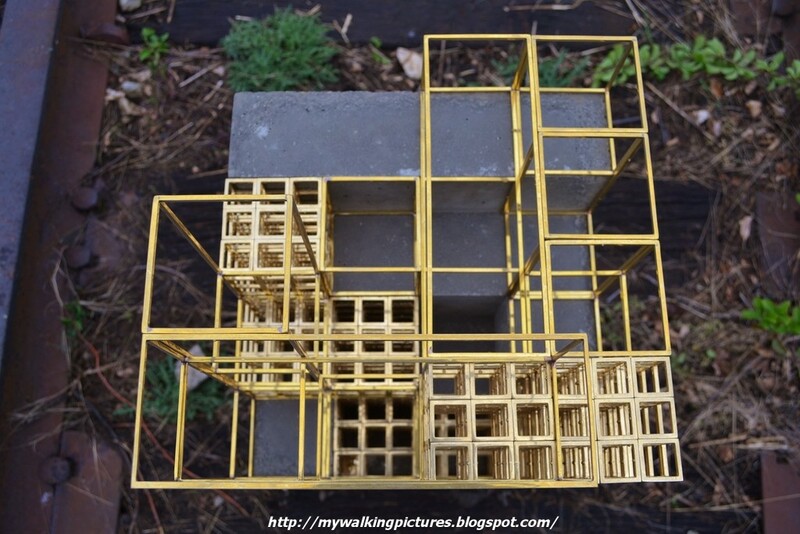 The next sculpture is a similar to the one before but a little simpler. At an angle, it looks like a giant metal chair. Weeds and other vegetation grow along the tracks. 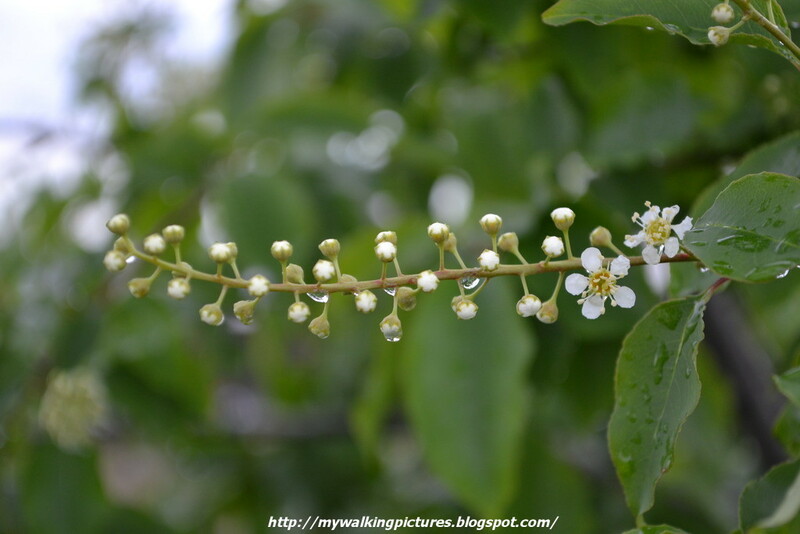 I think this is pokeweed, its flowers still glistening with raindrops. The next sculpture we came across was a flat piece of metal, looking like a bed inviting you to lie down and gaze at all the tall buildings across the rail yards. 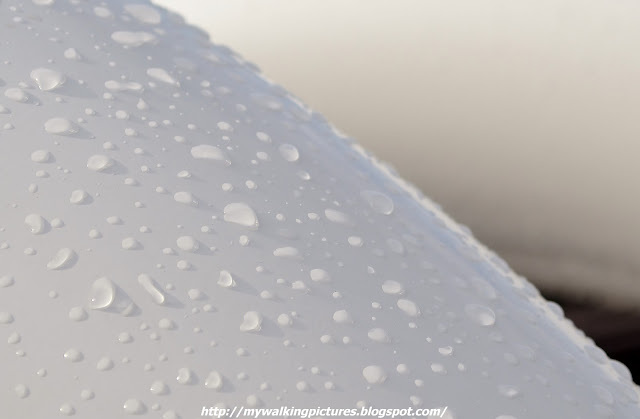 In the pic above, you can see the discoloration of the piece. This piece was in a storage unit when hurricane Sandy struck and a part of it was submerged in flood water. You can see a closer look here. 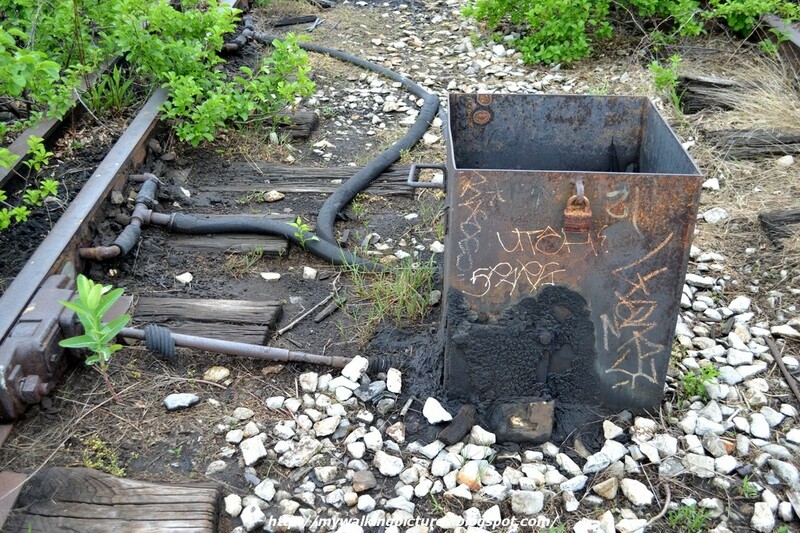 By this time we were in the area where the tracks curve towards 30th Street. On the building across you can see the water tanks at the top, a familiar sight on the rooftops of the city. The next sculpture was a little bit like the first one we came across. 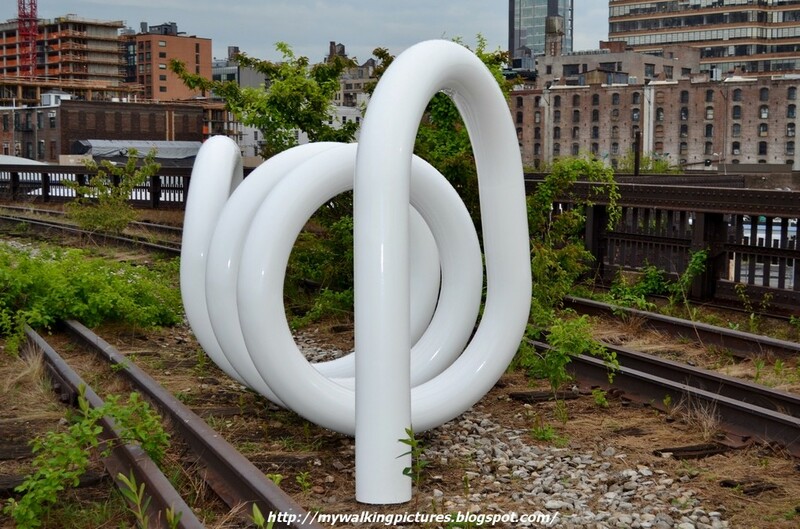 And if you go around and look at it from another angle, you would see a completely different sculpture. I had this view of the city from where I was standing at. Once the Hudson Yards Redevelopment Project takes off, I'm sure this will be a completely different view. 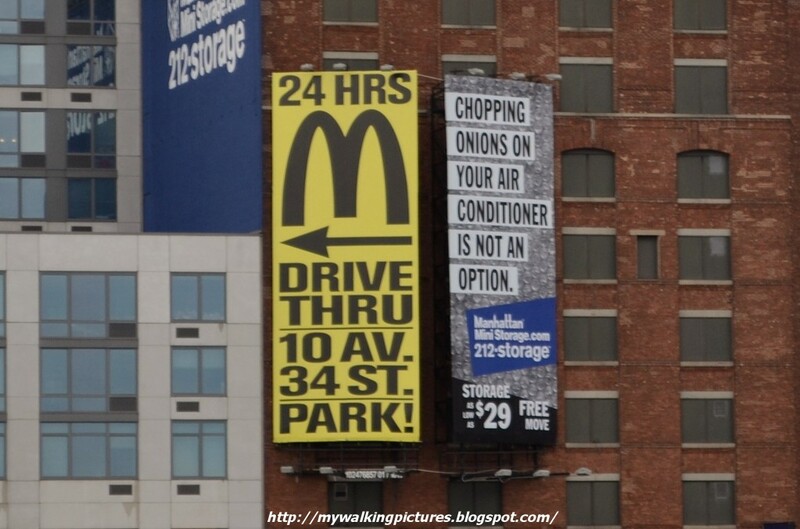 I love the quirky ads from Manhattan Mini Storage. Here's one of them hanging from a building near the tracks. 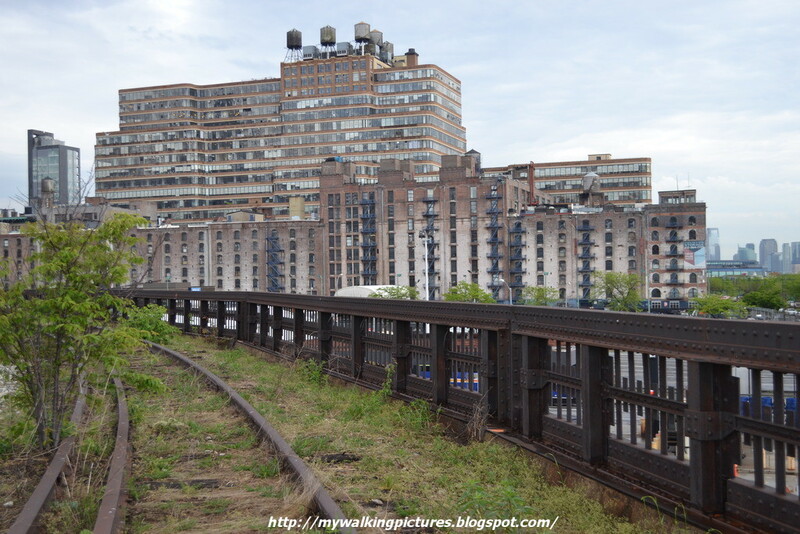 We are now at West 30th Street where the end of the rail yards meets the northern end of the current High Line Park. This area is where the last two sculptures are placed. These sculptures are smaller in size compared to the ones we already saw. This one looks like a series of small steps. 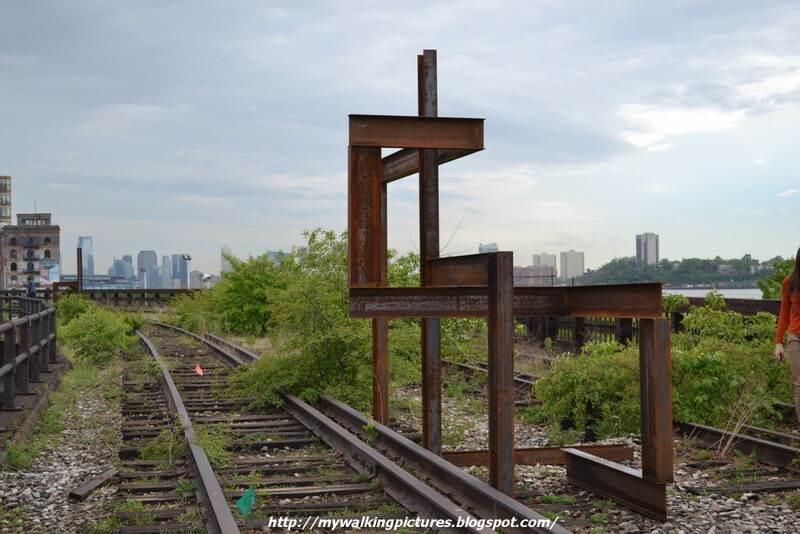 Near this sculpture are items from time past, when freight trains were still running along the train tracks of the High Line. This one is a switch box. 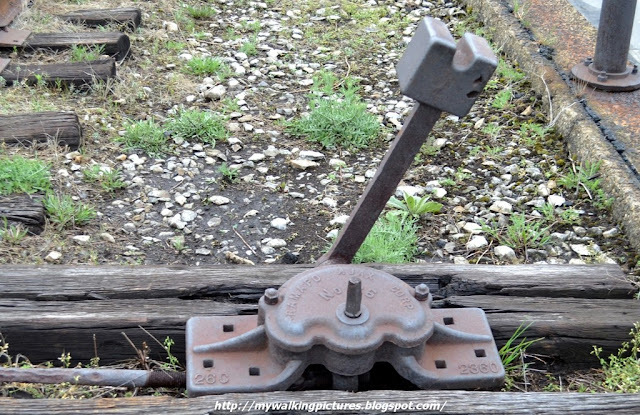 I'm not familiar with railway or train parts but I think this is a switch lever, you can see the words Ramapo Ajax Corp.No. 26. The last of Carol Bove's sculpture looks like a gold mesh mounted on concrete. Too bad about the cloudy day, I'm sure the gold lines of the sculpture would make a great frame for the sunset. I did try to frame the sliver of light in the cloudy skies. We had to go back to the 34th Street entrance as there was no connecting entrance to the current High Line space. Here's what the 30th Street tracks look like looking west to the Hudson River. With the development of the area still ongoing, with some even in just the planning stages, and thus subject to changes, this part of the High Line will serve as an interim walkway. 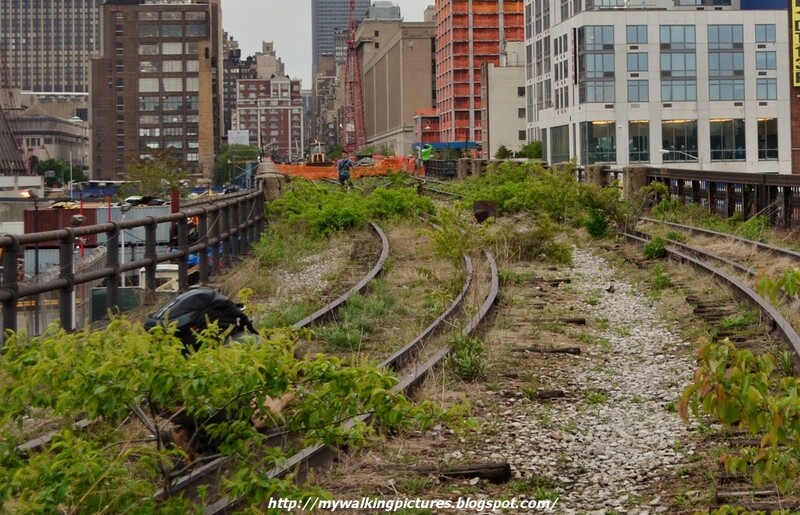 "The High Line will adapt and change gradually with the neighborhood," said Peter Mullan, vice president for planning and design at Friends of the High Line. 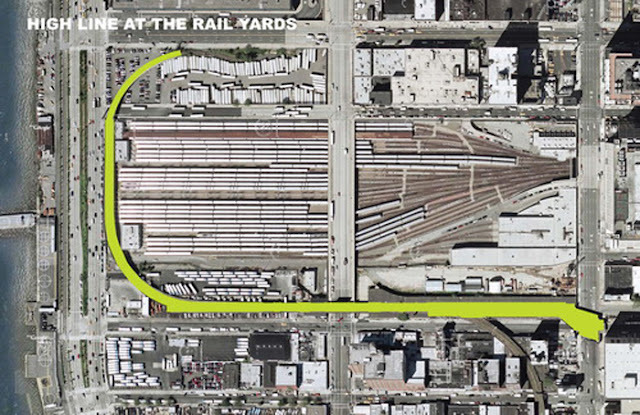 "It will be a unique vantage point from which to see the transformation of Hudson Yards." To preserve their options, High Line leaders are building more than half of the third section simply as an interim walkway. There, the current, unlandscaped vegetation will remain untouched. "We will just put down a simple path in the existing landscape," Mr. Mullan said. "On the one hand, it's less capitally intensive. 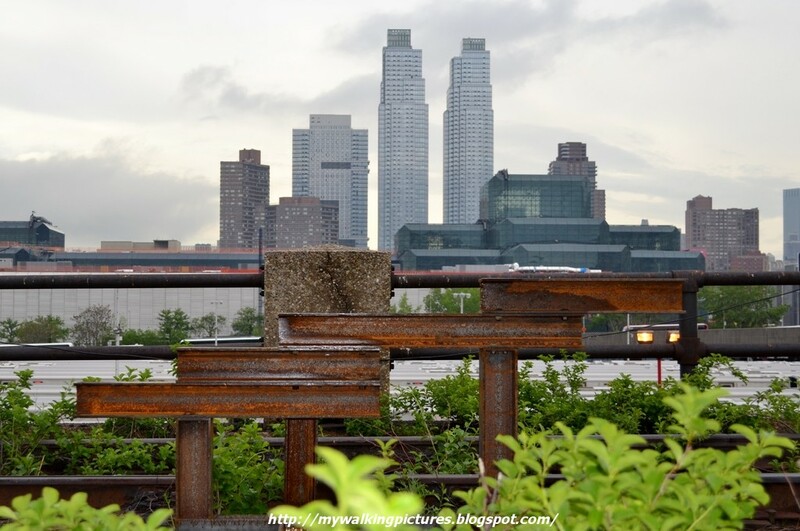 Also, we think it's exciting to allow people to see what the High Line was." For more on the projected development of the area, scroll to the lower part of this link. The link also has several maps of the area which would show you where we walked that afternoon. Remember the first photo I posted above? 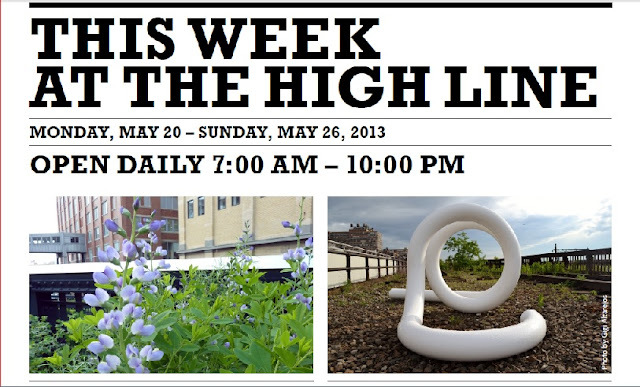 The High Line used it in their vitrine for the week May 20 - May 26. Isn't that cool? And I'm honored to see some of my pics featured on their Flickr Page. 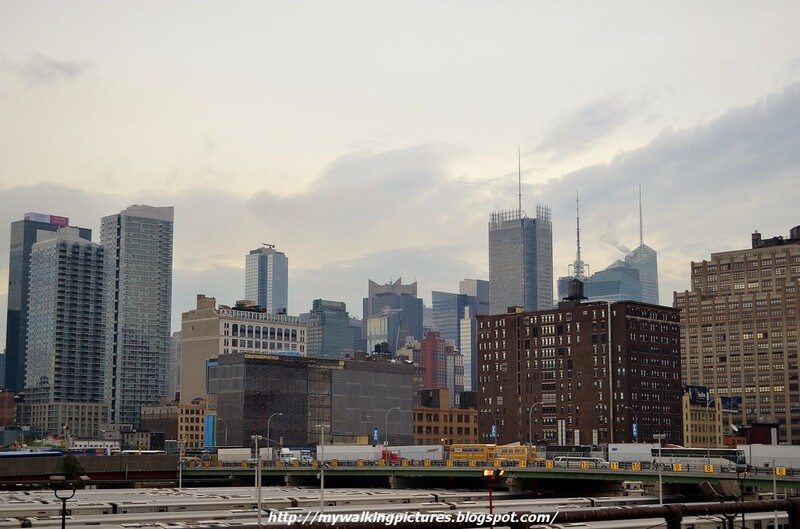 As we were walking back to where we started, I gazed south and saw a familiar sight rising tall many blocks away. 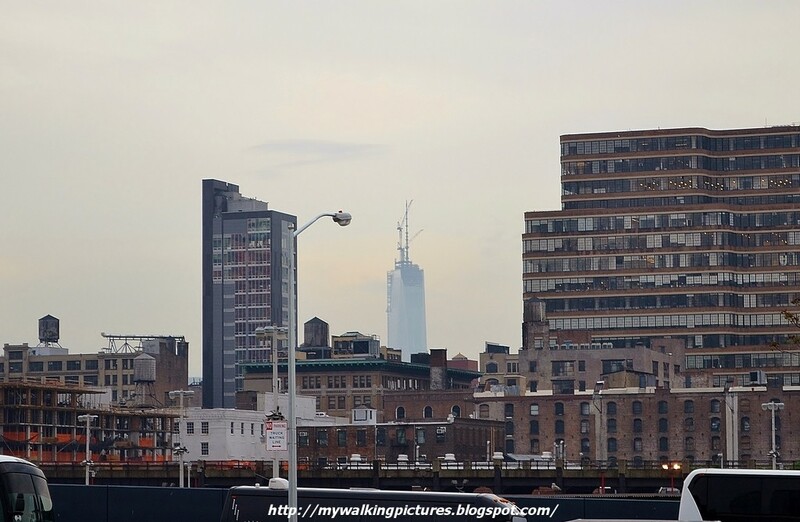 One World Trade Center can be seen from this phase of the High Line. I hope the ongoing development won't obstruct this view. Thank you Friends of the High Line for giving me the opportunity to preview Carol Bove's sculptures, and see the last phase of the High Line at the Rail Yards in its natural state. Much appreciated! 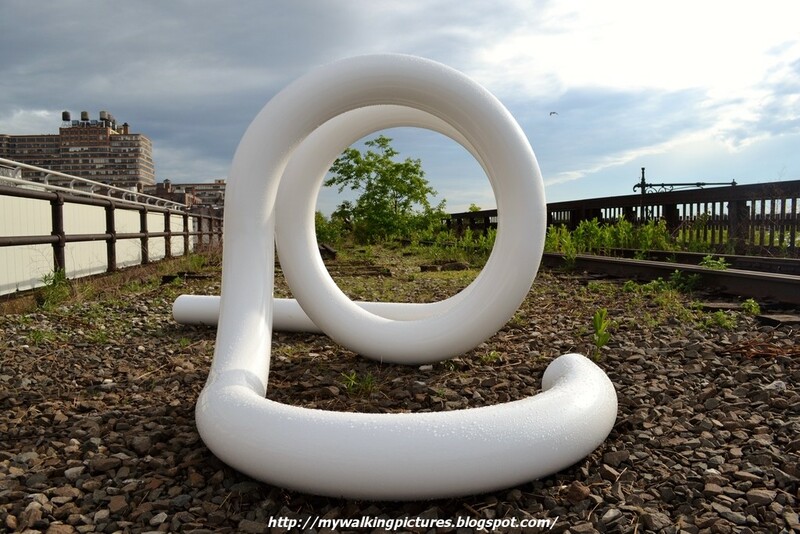 Carol Bove's sculptures are viewable during public walks on Thursdays, Fridays, and Saturdays until May 2014. Advance reservations are required. Admission is free and reservations can be made here.